Guests of the review were representatives of the diplomatic and political circles, the fashion, cultural and business elite, including the Swiss ambassadors. Muriel Berce Cohen, of Montenegro - HE Mrs. Snezana Radovic, HE Dolphin Plana - Deputy Ambassador and Counselor of Kosovo Ministerial, Ambassador of India - HE. Ms. Puja Kapoor, China's Ambassador, HE. Mr. Zhang Haizhou with his wife, the wife of the Ambassador of Japan, Mrs. Kazue Vatanabe, the President and Vice President of International Women's Club - Sofia, respectively Albena Jones and Maya Metodieva, representatives of the Embassy of Armenia and others, as well as Violina Marinova, Maya Antova, Svetlana Sharenkova, Vesela Draganova, Teodora Drenska, Anna Sendova, Lili Nestorova, Bisera Peshova, Lilia Cherveniakova, Evgenia Kalkandjieva, Prof. Lubomir Stoykov, the world famous Italian designer Alberto Vedelago and his Bulgarian colleagues, Sofia Borisova, Irina Sardareva, Neli Koleva, Miglena Petkova, Tanya Yan. 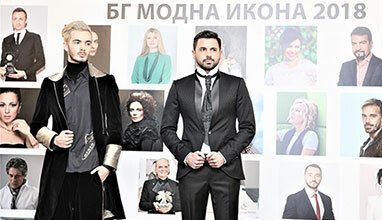 The event was also respected by Sanya Borisova, Valeria Veleva, Iliana Benovska, Radoslava Mincheva, Mila Zaharieva, Bogdan Tomov, Pavel and Edita Tsvetki, Nora Nova and others. The clothing style in autumn and winter of 2018-2019 eliminates the boundaries between fantasy, functionality and pragmatism. The high technology used in fabrics and the combination of different fabrics give the clothing a modern and fresh look. The designer relies on wool, leather, silk velvet, silk taffeta, lace, knitwear, boucle. The patterns include tweed, pepper, fish bone, box, jacquard fabrics with embossed flowers. The colors are dominated by black, gray, cardinal red, pink, green. Military uniforms are recognizable in one of the themes and developed in a new interesting way - jackets and jackets with high buckling, two-seater jackets and long coats combined with shorts, elongated skirts and dresses and classic trousers. Combining leather with three different tweed patterns makes garments look spectacular and different. Minimalism is also presented in the collection through the clean and straight lines of the garments, but the new elements that are visible give them a slightly dramatic look. Straight coats and coats with a lightly cut silhouette combine with elegant dresses, skirts and trousers. Combining tunics with skirts and trousers adds a youthful and extravagant look to the clothes. Here, in addition, feathers and beautiful embroidery of flowers are used. The lengths of the dresses and skirts are above the knee. Trousers are slightly cut, some of them with a length above the ankles. 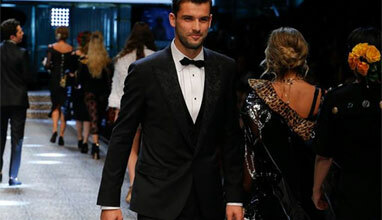 For formal occasions, the ladies can wear costumes with skirts and trousers, short and long dresses made with a combination of glossy and matte fabrics such as velvet, taffeta, lace and chiffon. Embroidery from beads and sequins is typical for evening wear. 14. Fashion show of "Jeni Style" Fall / Winter 2018. 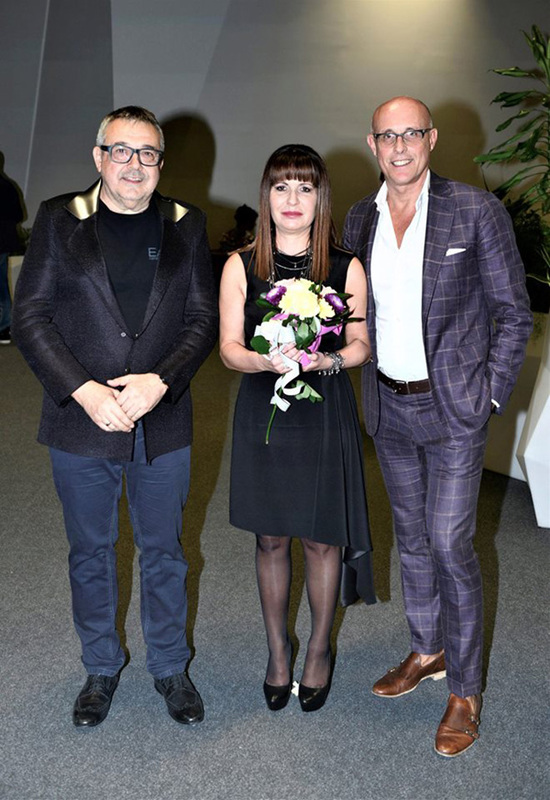 The photo – designer Evgenia Zhivkova with the famous Italian stylist Alberto Vedelago and prof. Lubomir Stoykov – PR manager and media consultant of the event. Sofia, Sigma Hall in the Paradise Center, September 18, 2018. 15. Fashion show of "Jeni Style" Fall / Winter 2018. The photo – actress Sanya Borisova with interior designer Gergana Zefirova and prof. Lubomir Stoykov – PR manager and media consultant of the event. Sofia, Sigma Hall in the Paradise Center, September 18, 2018.